The OrbitalPlus satin nickel, dimmable 9w LED, fire rated IP65 bathroom downlight with cool white LED’s is functional and stylish. High output from the dimmable cool white 9w LED module gives 460 lumen, with A rated energy efficiency and long life expectancy. 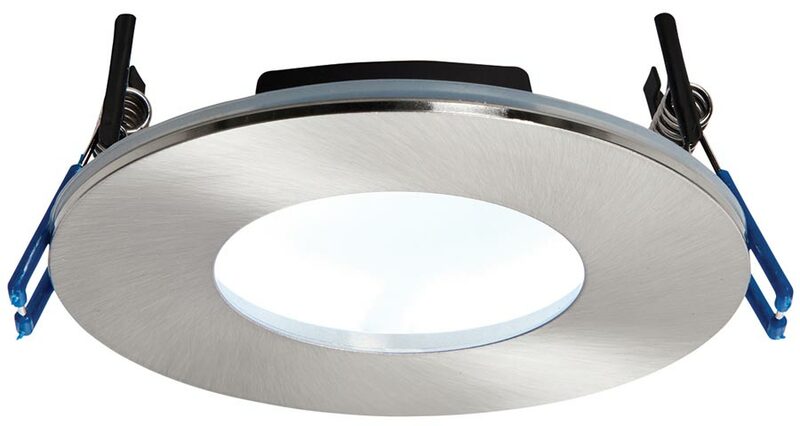 This 90 minute fire rated downlight has a unique and patented indirect light output featuring a wide 120° beam angle for reduced glare, able to be covered with insulation and fits into shallow ceiling spaces. Supplied with a dimmable Eaglerise driver and supplied with a five-year warranty. Minimum void recess 75mm, cut-out 94mm.